BENEATH THE DIM LIGHT OF A FULL MOON, MADNESS REIGNS. . . . As night descends on Cincinnati, the city braces for hell on earth: The populace mutates into huge, snarling monsters that devour everyone they see and act upon their most base desires. Planes fall from the sky. Highways are clogged with abandoned cars, and buildings explode and topple. The city burns. And when daylight comes at last, the same monsters return to human form, many driven insane by atrocities committed against friends and families. . . .
Only four survivors are immune to the metamorphosis: a smooth-talking thief who lives by the code of the Old West; a bank teller who’s put her past behind her; a wealthy, disillusioned housewife; and a desperate teenaged runaway. Together they form an unlikely quartet that must find a way to stop the apocalypse before the next full moon. William D. Carl is a freelance writer living in Cincinnati, Ohio. Don’t even think about reading this one right before going to sleep or that this is just another little story about werewolves since this is a horror story at the genre’s best! 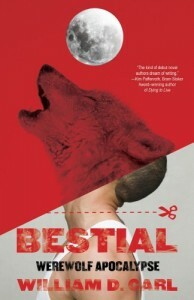 The werewolves in this book are not the fluffy kind found in a lot of young adult literature today. These are vicious man eaters, bent on death and destruction in a sort of sexual way. The four main characters create a weird group that pull together while this apocalypse happens over 3 days and under the full moon in the city of Cincinnati. The characters are all strong leads but my favorite is Chesya, a bank manager who is in the middle of a robbery pulled by Rick, who is a smooth talking criminal, but is frightened by dark, enclosed spaces. She is smart and resourceful while being calm under pressure. The other members of the group fighting for survival are Cathy and her son, Christian. Christen has run away from home after his rich, lawyer father abuses him and his mother does nothing Well, she does end up killing him when he turns into a werewolf which is a pretty awesome scene! This kid is also smart and unravels much of the mystery of why only certain people are changing and others are left unaffected. Overall, this is really a super fast pace horror story much like Stephen King’s earlier efforts and read like a script for a television show since everything was easily visualized. This only took me a few hours to read. I still wouldn’t recommend this one for bedtime reading since i ended up running in my dreams the whole night. This giveaway is sponsored by Permusted Press and THREE copies will be available. +1 Leave a comment daily with a way to contact you. Thanks for this amazing giveaway! I would love to win this book! Looks like a great book…I’d love to give it a read. Thanks for the giveaway! Sounds like an fantastic read! A werewolf apocalypse set in my home state of Ohio?! Say no more! I want in on this giveaway!! Thanks for the giveaway. I love Werewolves.